Check it out … Spring cleaning time is also a good time to consider a spring electrical inspection. This week, GRDA shares some tips you may want to keep in mind as you take on the task of readying your house for spring and summer. Planning to do some spring cleaning during this stretch of nice weather? If so, the Grand River Dam Authority wants to remind you that spring cleaning time is also a great time to perform some spring electrical safety inspections in the home. To assist you in that process, we are once again passing along these tips from the Electrical Safety Foundation International. 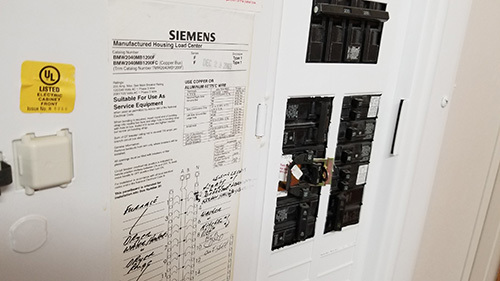 The label inside the door or cover of your electric service panel should have a date to let you know when your electric system was last inspected. Is it time to inspect it again? Contact a licensed, qualified electrician and schedule an inspection. Although we may not be at this point just yet, once you are finished with your furnace for the season, consider having it inspected by a licensed, qualified professional. Check for excessive vibration or movement when the washing machine or dryer is operating. That movement can put stress on electrical connections. Make sure the area around the dryer is free of clutter, and clean the dryer lint filter after each load. Keep appliance cords away from hot surfaces like the range or toaster. Unplug the toaster and other countertop appliances when not in use. Vacuum refrigerator coils to eliminate dirt buildup that can reduce efficiency and create a fire hazard. Before firing up those electrical trimmers, inspect them, and other appliances, for frayed cords, broken plugs and cracked or broken housing. Repair or replace damaged items. If recent warmer days have accelerated your spring “to-do” list, please keep these tips in mind. Your friends at GRDA want you to stay safe.